Home to Edgewater Beach, Gordon Square Arts District, Cleveland EcoVillage, Lorain Avenue Antiques District and more. 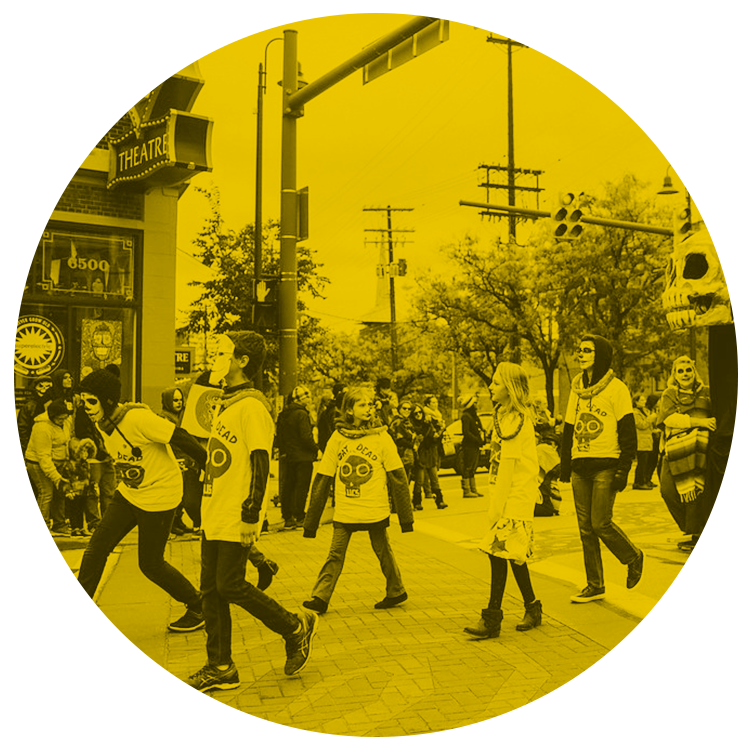 Detroit Shoreway is a thriving, vibrant, diverse and walkable Cleveland neighborhood. The area today known as Detroit Shoreway was first surveyed in 1806. In the years that followed, families began to populate the area. In 1827, the opening of the Ohio Canal stimulated the first urban development on the near west side of Cleveland, and the canal remained the most popular means for shipping and travel for the next 20 years. Once considered part of Brooklyn Township, the Village of West Cleveland, and Ohio City, the area began to shape its own identity and was absorbed by the City of Cleveland in the late 1800s. Industry developed in the northern portion of the neighborhood along the lakefront when the Lakeshore and Michigan Southern Railroad was constructed in the 1850s, and in the south in conjunction with the Cleveland-Columbus Cincinnati Railroad. Many plants, such as the Walker Manufacturing Company (Westinghouse building), prospered as a result of the rail service. In the 1860s, Detroit Avenue near West 65th Street developed with homes, businesses, and horse-drawn street cars. The area is now known as Gordon Square. Later the horse-drawn cars were replaced by electric street cars. Large, architecturally-distinguished homes were built along Franklin Boulevard to the immediate south. Families from Ireland and Germany were the first to settle in the area of West 65th Street near Madison Avenue in the 1880s. Irish Catholic residents established St. Colman Parish and German Catholic residents established St. Stephen Parish. Just south of Detroit Avenue, Bethany Presbyterian Parish was founded in 1889 and was comprised of Scottish, Welsh and Irish immigrants. Fir Street Cemetery was established in 1866 and is Cleveland’s second oldest Jewish cemetery. Located at 6015 Fir Avenue, the Hungarian Aid Society acquired part of the land and later joined with Western Cemetery established by Polish immigrants. At the turn of the 20th century, families from Italy, Romania and other parts of Southern Europe began to immigrate to the neighborhood. The Italian community established Our Lady of Mt. Carmel parish, and the Romanian community established both St. Helena and St. Mary, the former being the first Romanian Byzantine Catholic parish in America. The community and its new residents thrived throughout the early and mid 20th century, with plentiful jobs available within walking distance. The many European ethnic groups that had settled in the neighborhood co-mingled and began to develop new, shared identities as white Americans. The iconic Gordon Square Arcade was built in 1921, which became the economic anchor of the Gordon Square commercial district. The Arcade consisted of a hotel, farmers market, offices, shops, billiards, the Capitol Theatre, and more. Cleveland and the neighborhood’s economy began to shift after World War II. Many businesses closed or moved out of the city. Major highways were developed from the 1930s to the 1950s: the Shoreway (Route 2) was built at the northern end of the neighborhood in the 1930s, and Interstate 90 was constructed to the south in 1956. Highway construction not only demolished parts of the community, but also pulled opportunity and growth out of the heart of the neighborhood. Later, many neighborhood residents would protest additional highway construction. The site where the Michael J. Zone Recreation Center stands today was initially slated by the Ohio Department of Transportation for the so-called Parma Freeway, which would have been a north-south state route. Having already experienced the devastation wrought by the construction of I-90, residents organized. Opposed by both Councilman Michael Zone and later by Councilwoman Mary Zone, Cleveland City Council passed a resolution in 1979 releasing land acquired for the interchange for use as recreation and other public purposes. Like many cities and neighborhoods, Detroit Shoreway was affected by white flight from the 1950s onwards. Highways, interstates and the rise of the automobile suddenly made suburban living accessible to thousands, though restrictive real estate laws made suburbia accessible to white families and excluded households of color. Many white families of means who could afford to leave the Detroit Shoreway neighborhood did so. Housing values continued to drop in the 1960s and 1970s, and many historic buildings fell into disrepair. In 1978, the parapet of the Gordon Square Arcade fell onto West 65th Street, and the City of Cleveland made plans to demolish the structure. During this time, community members, led by Judge Raymond L. Pianka, Father Marino Frascati and Councilman Michael Zone came together to form Detroit Shoreway Community Development Organization (DSCDO). Founded in 1973, DSCDO was able to successfully acquire the Arcade building and went on to create a master plan for neighborhood redevelopment. Learn more about DSCDO’s history here. By the 1990s, the median home sale price in the Detroit Shoreway neighborhood had fallen to only $16,000, but DSCDO continued to advance numerous redevelopment strategies. The Cleveland EcoVillage conceived in 1998, centered around the West 61st Street and Lorain Avenue Red Line Rapid Transit Station. With the conclusion of the $30 million capital campaign, the Gordon Square Arts District Board elected in 2014 to continue its focus on the arts in support of economic development. Learn more about the Gordon Square Arts District’s current programming. Catalyzed by both the growth of Gordon Square and by the $90 million Lakefront West project thanks to the advocacy of leaders such as Councilman Matt Zone, private housing development began to take off in the early 2000s. Vintage Development began construction on Battery Park on the site of the old Everready Battery Co., overlooking Lake Erie. Battery Park is now a $40 million development. In 2017, NRP Group completed The Edison at Gordon Square on another 20 acre former industrial site. In 2014, Detroit Shoreway was named the hottest housing market in Northeast Ohio. In 2013, Cleveland Metroparks took over the previously state-managed Edgewater Park, and opened the new world-class Edgewater Beach House in 2017. The lakefront park now serves as an iconic, accessible recreation site for all neighborhood residents and visitors. Today, Detroit Shoreway is one of the most racially and economically diverse neighborhoods in the city of Cleveland, with a population that is 49% Non-Hispanic White, 24% Non-Hispanic Black, 25% Hispanic, and 3% other groups (source: Progress Index). As part of the neighborhood’s thriving Hispanic community, Sagrada Familia Parish opened in 1998 at 7719 Detroit Avenue, where today there are 23 different Hispanic nationalities represented with 1,600 registered parishioners. Visit Cleveland Historical for more historical information about the Detroit Shoreway neighborhood, or download a historic walking tour.